Audiences had long asked author David Bain for more stories on Gentleman Jim "The Demon Duelist" Brodie and Dr. Darius Darke from the story "The Cowboys of Cthulhu". Well - here you be, pard! 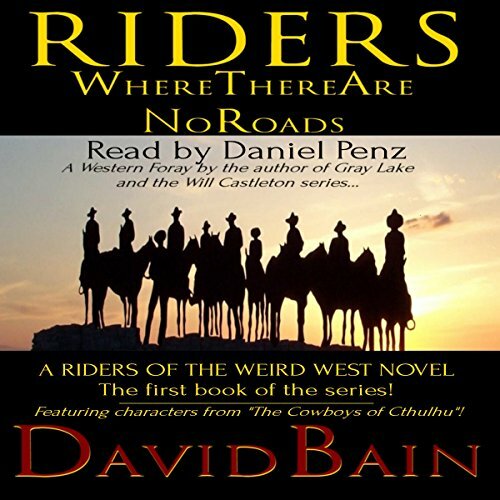 Riders Where There Are No Roads is the first full novel in the Riders of the Weird West series. There's roping, riding, an interdimensional badass, shootouts, demon cowboys, a dragon, a pickup that's really a horse (or is it the other way around?) and a mystical biker/cosmic marshal who might just be orchestrating it all! I absolutely loved RIDERS WHERE THERE ARE NO ROADS. This was such an awesome story. I would say it was even somewhat of a noir-ish weird western. David Bain is an exceptional author whose work really resonates with me. RIDERS grabbed me from the start and I didn't want it to end. I felt as if I was right there. It held my attention entirely. I definitely want to hear more. I love the setting of this story and the characters were Amazing. All of them. I especially liked Rosarita Bandita. She was something else. I was glued to this audiobook and I'd highly recommend this one not only for the awesome writing but the killer narration. Daniel Penz. All I can say is WOW. His performance was incredibly good. Every character had a distinct voice and persona and they were ALL excellent. If I had to choose one, I'd go back to Rosarita. I was blown away by how he nailed her accent and her character. He is a very talented voice actor. This was a fab author/reader win. Loved it. I'm ready for the next ones! If you could sum up Riders Where There Are No Roads in three words, what would they be? An engaging Weird West book. Mr. Penz's perfomance was amazing. All those characters with different voices! How does he do it? I enjoyed the wonderful telling of this strange story. Each character has his or her own voice, and I could never do that if I were just reading it myself. If you could rename Riders Where There Are No Roads, what would you call it? "When the Riding gets Weird, the Weird Start Riding"
A great listen. I only wish it had lasted twice as long! Zane Gray meets H.P. Lovecraft -- and it works well! Looking forward to more stories of The Weird West from Mr. Bain! before reading this review I must disclose that I was given this book for free. for my unbiased and honest review. The story was a little difficult to get into as well as follow . But once I was a ways into the book I couldn't put it down, I even went back and listened to parts a second time. The narrator does a fabulous job with the different characters. the only possible complaint would be that he read a little slow because of the details put into each character. This has to be the absolute worse book I have ever come across. HISTORY IS MADE BY THOSE WHO TELL IT. Don't let the influenced reviewers tell it. I'm ON A MISSION FROM GOD. Bain takes us on a drug induced dream that makes no sense. It is not a good fantasy, not a good western, not readable. I did not get this for free, I wasted my money, don't you make the same mistake. Not my genre, but still fun! To be honest this isn't my regular genre, but I love westerns and wanted to delve into the world of the Weird. What was one of the most memorable moments of Riders Where There Are No Roads? The best part of the book is the narrator. I have several fiction books and Daniel Penz gives everyone their own voice. A different voice for each character. That does not often happen and it makes the story easier to keep up with, if this genre is not your passion.